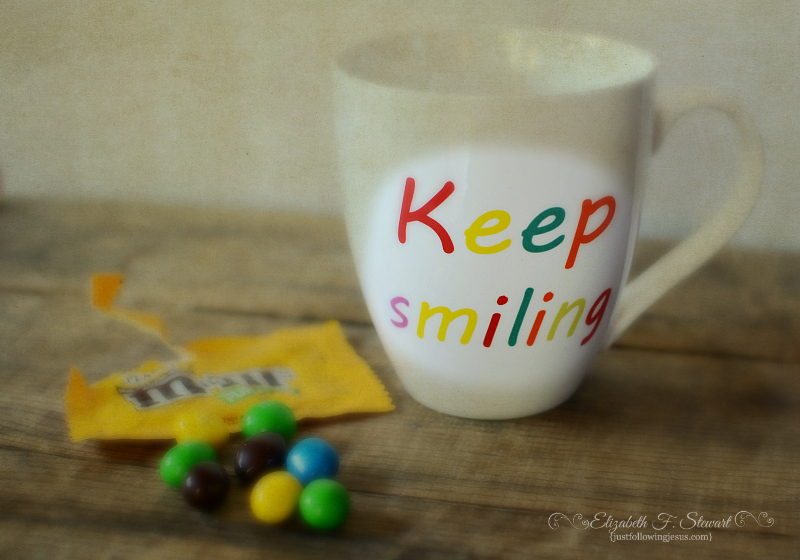 Just following Jesus in my real life...: Keep Smiling! My husband bought a large bag of these fun size peanut M&Ms packages for the grandkids. The only problem is, they are pretty much on the top of my favorite candy list. so indulging every once in a while is okay. I just need to make sure there are still some left for the grandkids! My favorite photo this week is the fourth one down. So, which one is your favorite photo and what's your favorite candy? I kinda like #3. I like how the Keep Smiling is highlighted! My favorite candy? Well, I do love plain M & M's - but I'm also sorta addicted to these coffee candies that I buy...and eat...perhaps a whole bag at a time. I love coffee nips candies, too. Now you made me want to go get some! Love the mug! And Peanut M&Ms are one of my favorites. I'm not sure I could limit myself to just one. Barbie, peanut M&Ms are pretty hard to resist! That's why the little fun packs work for me. I can indulge once in a while without overdoing it. A bowl or jar...I couldn't stop. 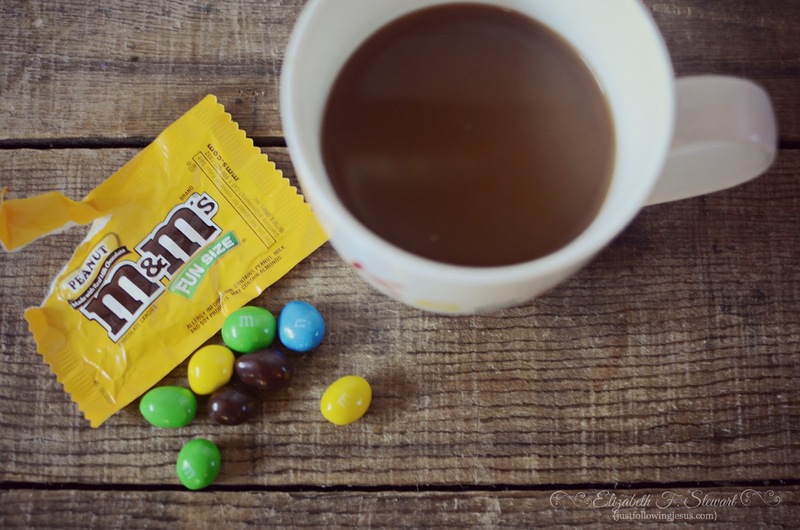 Love M&M's, really like image 5, the best way to eat them is with a great cuppa. Great editing of all your images. Carmel, we are in total agreement about the best way to eat M&Ms. Thanks for your encouragement about my photos. I don't really like candy, I prefer chocolate. But I will eat pebbles if you force me to (or even if you don't). I'm not sure if you have pebbles in America. They're like M&Ms only nicer. Oh, now I want to try pebbles, whatever they are! I always love your pictures, but truly the best thing about your post today was that I now know that those little fun packs only have 90 calories! I've lost 20 pounds over the last year or so, and keeping it off is a challenge. Once in while I need a little indulgence - and these will be perfect! Seriously, I love your composition with the sweet mug and the treats! Donna, I'm really trying to be good! I got a Fitbit for my birthday in August and it tracks all of my steps and I log everything I eat. But, yes, sometimes a 90 calorie indulgence is just what I need! I'm a chocolate and peanuts girl, too! Love them all. Another reason I like you! #2 is my fav but they are all good! It helps that the little fun packs are all sealed. If it was an open bowl or jar of peanut M&Ms I would be a goner! Turtles are candy for sure! Chocolate, nuts and caramel...YUM! Oh, these are so much fun! Really love the 4th shot...and I still LOVE peanut M&M's. Yes! 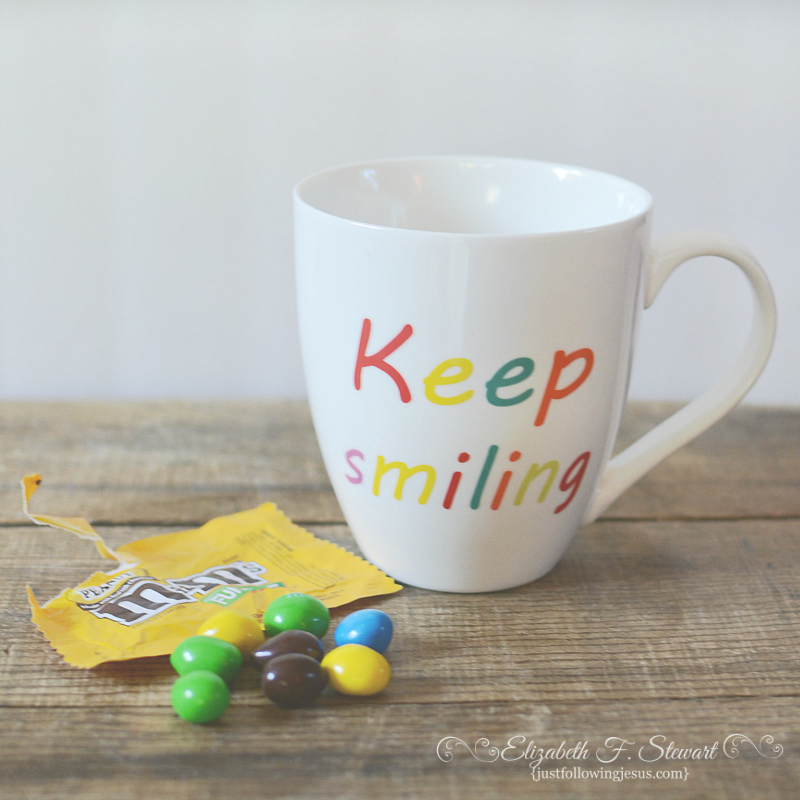 What's not to love about peanut M&Ms! My favorite is the first photo. Favorite candy...hmmm....we are not big candy eaters here so I don't have a favorite. Blessing likes skittles and starbursts. Abrianna, thanks for stopping by! Grandkids have reintroduced candy into our household...not all the time, but grandparents gotta spoil the little ones sometimes! I like the fifth one down (the darkly textured one) and the first one too. 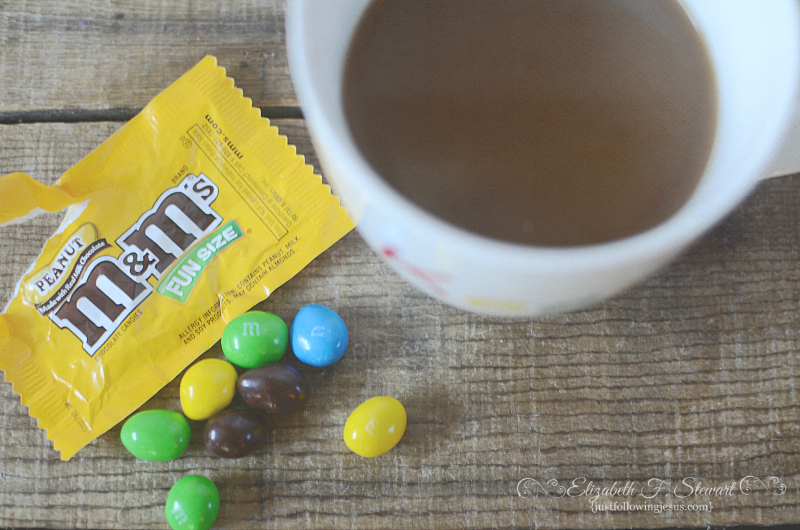 M&M's are yummy - have you tried the Mega M&M's? My favorite is any dark, dark chocolate. I do not know about mega M&Ms! Now I'm curious. My hubs is a dark, dark chocolate lover like you. I'm a milk chocolate girl. I love M&M's, too! And I guess my favourite photo is the last one - I love the PoV! I think the last one is my second favorite. I'm sure glad you came by and left your encouraging comment. So hard for me to choose my fave. I do love seeing your creativity in this way. You just ooze art, ya know? My fave candies though...not so hard to pick. Reeses Peanut Butter Cups, Junior Mints and York Peppermint Patties. Mike and I went to the movies over the weekend and enjoyed some Hot Tamales. Another childhood favorite. :) Much love to you! I do like Hot Tamales an awful lot, too! I like all the photos. And as far as candy goes.....we are kindred spirits. UMMMM! Peanuts and chocolate and Resse's Peanut Butter Cups love them all. My mouth is watering as I read your comment. Yes, to being kindred spirits in our affection for chocolate and peanuts! Oh, yeah, chocolate and peanuts. Or, for that matter, chocolate and pretty much anything! Definitely something to keep me smiling. Thanks, Jill! It appears that many of us are chocolate/peanut lovers! The last photo is my favorite. 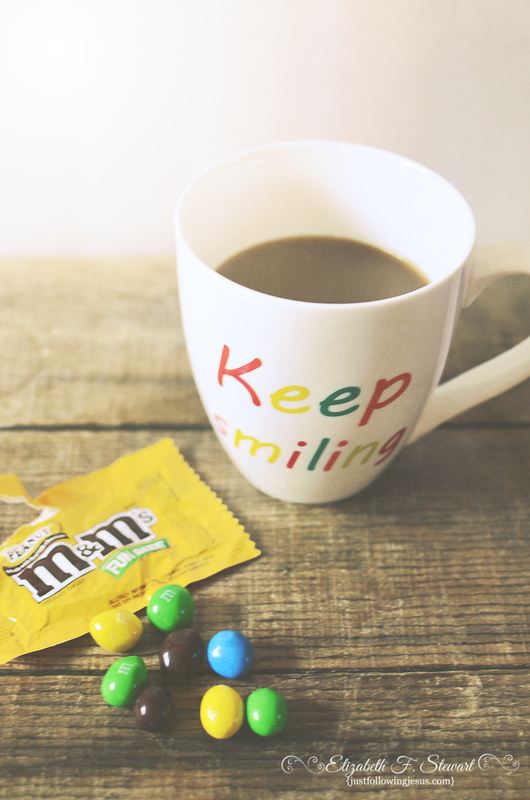 Many of the peanut m&m's are gone and so much of the coffee from the cup, Keep Smiling fits it perfectly. Peanut M&M's and Reeses Peanut Butter cups. 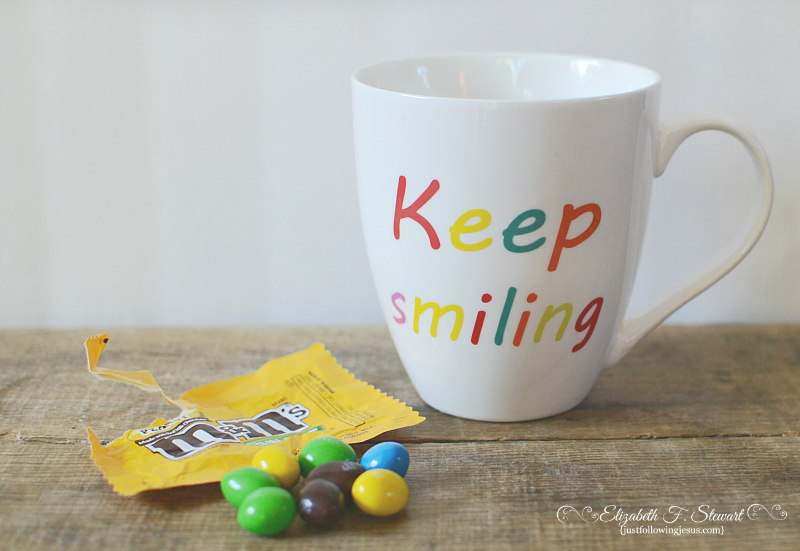 I let the peanut m&m's slowly dissolve in my mouth as I sip my coffee. Then eat the peanut. Ummmmmm…..good. Earl, we're of the same mind about favorite candies. And of course, perfect with coffee! I think I like the picmonkey's dusk. What a neat way to show/teach us! My favorite candy-----Mounds or Peppermint Patties. Thanks for this post, Elizabeth. A gal from our church makes homemade Mounds at Christmas. Yummy! Liisa, I'm glad I'm not alone! You have helped me keep smiling, dear friend! I absolutely LOVE peanut M&M's and my new healthy eating plan had me believing I wouldn't have them for a long time. When I saw the first picture it was a 'viola!' moment. Of course I can have some! I'm going to stop by the store after a meeting tonight and you can be sure I'll have those little packs of chocolate sweetness in my cart. Having one once in awhile won't mess up my new Fitbit at all! I've lost about 7 lbs since I got my fitbit! So happy you got one too! Even when "bad stuff" happens, we find blessings that can give us good reason to smile. Thanks for that reminder. True! Thanks for your encouragement. They are great on popcorn too! Thank you for your encouragement. And yes, grandkids are a huge blessing! Late, late for a very important date. but I know you get it since I have a certain hansom fella back in my life. ;-) I have to say these shots are so fun, I can totally see them on a wall somewhere, maybe a coffee shop. Hmmm, I do have a dream of owing a coffee shop... hmmm :-).